Lyrics Of Life Is A Game (Hindi Version) From Movie - Teen Patti (2010): A Philosophical Song sung by Anushka Manchanda, Sonia Saigal & music composed by Salim Sulaiman. Star Cast: Amitabh Bachchan, Sir Ben Kingsley, R Madhavan, Raima Sen, Siddharth Kher, Sharadha Kapoor, Ajay Devgn, Jackie Shroff. 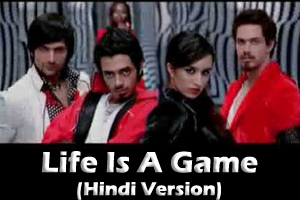 Lyrics of "Life Is A Game (Hindi Version)"
Lyrics in Hindi (Unicode) of "लाइफ इज अ गेम (हिंदी वर्शन)"